Nepal is a mountainous, less developed kingdom that straddles the boundary between the Indian and Himalayan tectonic plates. In Nepal, landslides represent a major constraint on development, causing high levels of economic loss and substantial numbers of fatalities each year. There is a general consensus that the impacts of landslides in countries such as Nepal are increasing with time, but until now there has been little or no quantitative data to support this view, or to explain the causes of the increases. 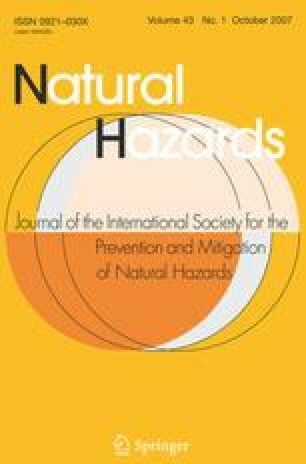 In this paper, a database of landslide fatalities in Nepal has been compiled and analysed for the period 1978–2005. The database suggests that there is a high level of variability in the occurrence of landslides from year to year, but that the overall trend is upward. Analyses of the trends in the data suggest that there is a cyclicity in the occurrence of landslide fatalities that strongly mirrors the cyclicity observed in the SW (summer) monsoon in South Asia. Perhaps surprisingly the relationship is inverse, but this is explained through an inverse relationship between monsoon strength and the amount of precipitation in the Hill District areas of Nepal. It is also clear that in recent years the number of fatalities has increased dramatically over and above the effects of the monsoon cycle. Three explanations are explored for this: land-use change, the effects of the ongoing civil war in Nepal, and road building. It is concluded that a major component of the generally upward trend in landslide impact probably results from the rural road-building programme, and its attendant changes to physical and natural systems. This research was partially funded by DFID under the Engineering Knowledge and Research programme, project R7815. The authors would like to acknowledge ongoing support from the International Landslide Centre at the University of Durham, funded by an anonymous benefactor. We would also like to thanks the LRA team in Nepal who compiled much of the data for the period 1978–2002 using Nepali sources.